Many of you may have seen our review of Miles Away, the new graphic created by Anthony Montgomery. Anthony was kind enough to take some time away from his busy tour and talk to us about where Miles Away came from and where it's headed. We were very impressed with the graphic novel, and after our conversation with Anthony, we're all the more curious about where the series will take us next. Here's what Mr. Montgomery had to say. Somnambulant Gamer: I understand we've caught you in the middle of a large tour. Where are you now? Anthony Montgomery: I'm in Perth, Australia right now. 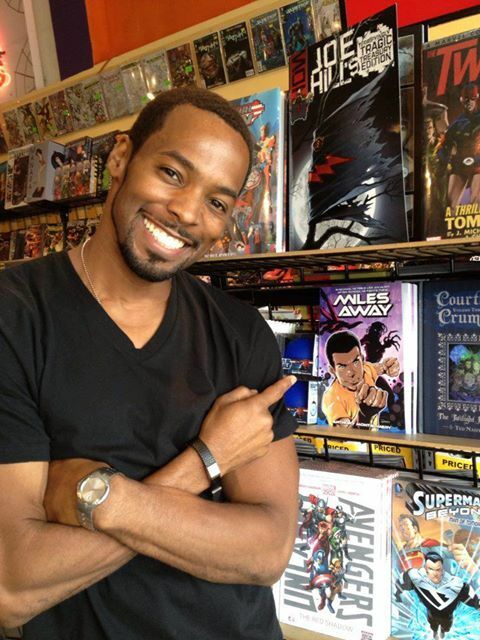 Miles Away launched April 24, 2013 with an initial appearance at the historic Golden Apple Comics in Los Angeles, California. I then appeared at Emerald Knights in Burbank. Next to Dusseldorf, Germany, then Denver, Colorado and now to Australia where I started in Sydney, went to Melbourne and finally Perth. SG: You mentioned in the afterward how Miles Away became what it is today. Where did the first characters come from? AM: The first characters came from the wild, wonderful, sometimes scary, usually interesting recesses of my mind. When the characters came to me, I kept coming up with other characters until I had about twenty initial characters that I wanted to be the foundation for the Miles Away universe. I also realized that in creating a science fiction universe there would always be room to add more complex and gripping characters in the future. SG: Did the character of Max change a lot as your story developed? If so, how did he evolve? AM: The core of Max’s character has stayed consistent from my original concept in 2001. The one major element I added is the fact that Max's ability isn't permanent (at least not until he visits Ro-­Twyla later in the series). This idea came about after I worked with Ralph Farquhar to help hone my pitches for our early meetings with Cookie Jar Entertainment and Disney. Ralph is an exceptional creator and writer and suggested that it would add depth to the character if he had an additional “weakness”, along with the fact that his ability takes five minutes to manifest. I liked Ralph’s idea because I want Max to be a role model for young people to teach kids that they can be heroic without having super powers. Max will have to rely on his own intellect and ingenuity to solve a lot of his problems, having powers is just a really cool bonus. SG: Do you still see Miles Away as an animated series, or are graphic novels the sole home for this story now? AM: Yes, I definitely still plan for Miles Away to be an animated series. As I mentioned in the book, my ultimate goal in launching this property as a trans-media franchise is to do graphic novels, an animated series and eventually transition to live‐action feature films. SG: How much of an influence on Miles Away was your time on Enterprise? AM: It wasn't solely because of my time on Star Trek: Enterprise because I came up with the idea for Miles Away early on during our first season of filming. At that time I wasn't aggressive in bringing my vision to fruition. SG: Miles Away has been pretty well received. Were you nervous about taking the step of publishing? AM: I was a little apprehensive, just because it's always slightly unnerving when venturing into unknown territory, but I wasn't very nervous. I just didn't know what I was doing. But I believe in God and I believed in my soul that I had created something special. Since I didn't have anyone to put Miles Away out, I figured I would just do it on my own and learn as I went along. Even though it has nothing to do with Star Trek, I always hoped that my core Star Trek fans would support the project as long as they trusted that I created a property that was quality. SG: What is your release schedule for Miles Away? Do you plan to do a monthly release schedule? AM: With the initial release in April, I've been taking a “grass-roots” approach to building the momentum for Miles Away. I don't currently have a monthly release schedule slated. I've been aligning my appearances to promote the franchise with the various sci­‐fi and comic conventions I have attended in the past (as well as attending the many that I've never attended). I’ll always update people through my different social media sites. SG: The story is very well developed. Did the struggle you had with the story early on help refine the ideas? How much has it changed from that first presentation to Cartoon Network? AM: Thank you.The heart of the story is still exactly what it was when I came up with the idea. What HAS changed is the way I present the idea. My pitch has changed over time. An Exec at Cartoon Network originally said it was too similar to Ben 10 based on a couple things: the name, Ben 10, (Miles Away was originally called M5); Max lives with his grandmother and Ben lived with his grandfather. The fact is, Miles Away is nothing like Ben 10, but because of the way I plan to reveal my story, I know that some comparisons to Ben 10 may be unavoidable. I changed the title because I didn't want anyone else to think the same as the Exec at CN, but M5 was always going to be Max's superhero moniker (which was the reason it was the title in the first place). And in many inner city homes, grandparents are influential in raising children, if they aren't the primary care givers altogether. My own home was no different. Any similarity is because that theme is a universal truth it would seem. SG: What and who are your primary influences for Miles Away? AM: The creation of Miles Away was influenced by all the wonderful sci-­‐fi I’ve been exposed to over the course of my life: Star Trek, Star Wars, Alien, all of them, and all of their brilliant creators, Gene Roddenberry, George Lucas, Ridley Scott, and numerous others. In creating my own universe, I just let my imagination run rampant just like all those amazing stories I had seen. SG: Can we expect to learn more about Max’s parents? AM: Yes, the revelation of Max’s parents will play a major part in the Miles Away story. I wanted to make sure the story had a relate-able human component so the driving force for Max is to learn his parent’s whereabouts and why they abandoned him and his sister. My desire is for people to connect with Max’s urge to discover the truth about his family. SG: How closely did you work with the artists? AM: I worked with the different artists in every aspect of the creation of the graphic novel. This is a project I’m very passionate about and I’m meticulous about all the elements surrounding it. Whether it was working with Phillip Boutte, who created my concept artwork, Jeff Stokely and Jey Odin, who did the pencils and inks, Dawnsen Chen and Rashad Doucet, who did the colors, Adam Pruett, who lettered the book (and, yes, lettering is an art in itself) or Brian Denham, who created my cover art, I was very hands-­on in making sure that everything created was in alignment with the vision in my head. We continually tweaked all of the artwork at different stages until I felt everything was exactly what I wanted. SG: What is the most surprising thing about Miles Away you've experienced so far? AM: I’d probably have to say the most surprising thing was how hard it was for me to find artists who were not only extremely talented but also people of integrity with a high level of professionalism. Although I’m an artist first, I approached this process as a business and I expected everyone I encountered to have the same level of commitment as business individuals. That wasn't the case. Once I found a solid team, though, I couldn't be happier with the end result. SG: With as long as you've been developing the series, how much of the story is already written? AM: I already have ideas for the first two seasons of the animated series (24 episodes) written, and I have more than a hundred additional episode ideas ready. I have a blueprint for the direction of the series, but I love the creative process and I plan to stay open to suggestions from my writing team, who I know will offer invaluable ideas that will only enhance the quality of entertainment that Miles Away will provide. SG: Do you already know how the story ends? SG: Has the reader’s feedback impacted your plans for future releases? SG: Do you have a favorite moment from the creative process for Miles Away you’d like to share? AM: There are a lot of wonderful moments that I love about the creative process while working on the Miles Away graphic novel, all of them culminating with me holding the completed book in my hands for the first time. It was an incredible feeling to see all my hard work realized. SG: Is there anything I haven’t asked that you’d like to talk about? AM: I think we've covered most everything. I’m sure something will come to me later, but that leaves us something to talk about in the future. Our thanks to Anthony Montgomery for his time and thoughtful answers. If you haven't done so already, pick up a copy of Miles Away, it's very entertaining, well written, original, and it's shaping up to be a great story that you and your kids will want to be a part of.